In a significant medical prothesis breakthrough, Rob Summers, 25, a pitcher for Oregon State University who was completely paralyzed below the chest five years ago after being struck by a vehicle in a hit-and-run accident, can now stand on his own for up to four minutes at a time — without support — and up to 25 minutes with assistance provided only for balance. What’s especially exciting about this research is that it turns out the spinal cord itself is smart enough and has enough plasticity to learn to control his legs without direct control from the brain. The research could also lead to treatments for Parkinson’s disease and stroke, the researchers suggest. Aided by a harness support and some therapist assistance, Summers can make repeated stepping motions on a treadmill. He can also voluntarily move his toes, ankles, knees, and hips on command, according to an UCLA statement. This achievement was the result of 30 years of research to find potential clinical therapies for paralysis by a team of scientists at the University of Louisville, UCLA, and the California Institute of Technology. The results were achieved through continual direct “epidural electrical stimulation” of the subject’s lower spinal cord, mimicking signals the brain normally transmits to initiate movement. Once that signal is given, the research shows, the spinal cord’s own neural network, combined with the sensory input derived from the legs to the spinal cord, is able to direct the muscle and joint movements required to stand and step, with assistance, on a treadmill. The researchers are using a neurostimulator device from Medtronic called RestoreADVANCED to provide the electrical stimulation, but the researchers plan to replace that with a custom design, according to Bloomberg. “The spinal cord is actually smart, and it can learn motor tasks it is taught, even in the absence of any input from the brain,” said V. Reggie Edgerton, distinguished professor of integrative biology and physiology and of neurobiology at UCLA. “The neural networks in the lumbosacral spinal cord are capable of initiating full weight-bearing and relatively coordinated stepping without any input from the brain. 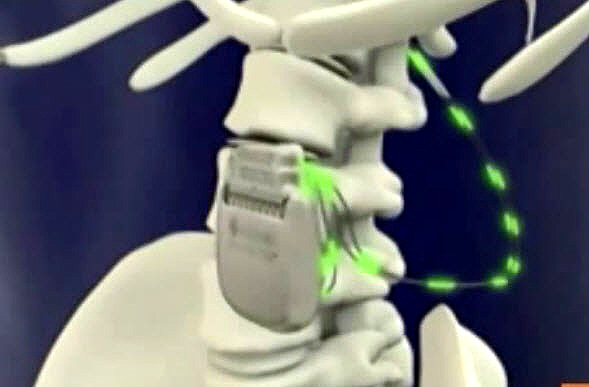 This is possible, in part, due to information that is sent back from the legs directly to the spinal cord. “This can happen with individuals with ‘motor- or sensory-incomplete’ injuries. That is, they cannot voluntarily or consciously move muscles that are enervated below the lesion. We are using epidural stimulation to increase the excitability of this network. using 16 electrodes connected to the spinal cord to increase the excitability of this network. “But we are not stimulating at an intensity that will induce the movement; we’re just modulating the activity level of this [spinal neural] network. The spinal cord can interpret the sensory information from the leg, even though the individual may not be able to feel this information. The spinal cord is smart enough to know what the individual is trying to do. “With the combination of increasing the background activity level of this network, and using the sensory activity of the leg, we’ve been able to achieve a level of function that has not been demonstrated before in an individual with a motor-complete injury. That is, this individual can stand for several minutes independently. “This research could also lead to treatment of other diseases and neuromotor disorders. It could help individuals with Parkinson’s and stroke,” said Edgerton. 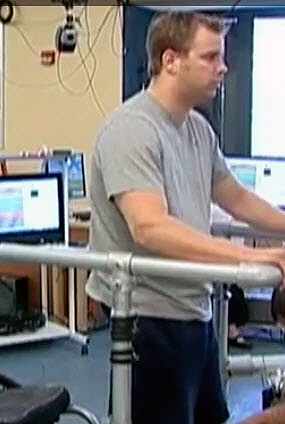 The researchers say they envision a day when at least some individuals with complete spinal cord injuries will be able to use a portable stimulation unit and, with the assistance of a walker, stand independently, maintain balance and execute some effective stepping. Relief from secondary complications of complete spinal cord injury — including impairment or loss of bladder control, sphincter control and sexual response — could prove to be even more significant, they add. The research was funded by the Christopher and Dana ReeveFoundation and the National Institutes of Health.